For those of you who have dined with us recently, you may have seen a new wine page on our digital menu. If you haven't checked it out yet, please do so. 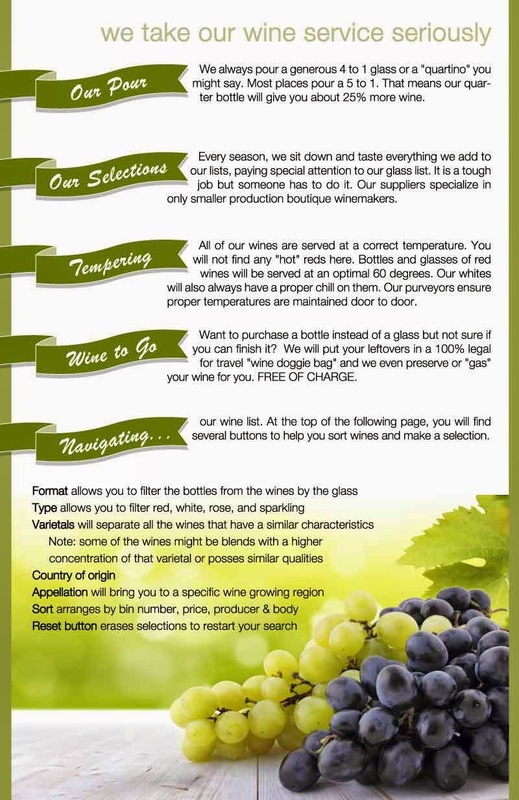 This page is an introduction to our wine program. One interesting update to our list involves how to search for a particular style of wine. When one is interested in looking over a wine menu, a list of 80+ bottles can be daunting. Most of the time, people have certain wineries that are their go-to wines. However, a particular style is what is looked at with highest importance. If you're a cabernet sauvignon drinker.... you are a full-bodied red drinker. If you like reislings or moscatos... you are a fan of light-bodied whites. As always, our servers are here to instruct and direct on how to use our digital list, but we have changed things a bit to make it easier to see these styles or wines. Our list is broken down into a handful of the most popular categories of wine styles. For reds, we have cabernet sauvignon, merlot, zinfandel, pinot noir and "other" reds. These "other" reds may include shiraz, syrahs and chiantis. Our whites as broken down into the popular varietals, chardonnay, reisling, pinot gris/grigio, sauvignon blanc and other whites. When we sample all these amazing wines, we do not limit it to these main categories. So we try to place them in the varietal category of a similar style of wine. When checking a particular style of wine... example, cabernet, you will now find all the cabernet sauvignon, cabernet francs and all other "cabernet-like" styles of reds. Looking for those lighter-bodied whites? Under reisling you will find things like a moscato or a gruner veltliner. Overall, these changes should make things a bit easier on the customer in search of a specific wine flavor. Mt. Beautiful Pinot Gris, New Zealand - A lighter pinot gris. The grapes go through fermentation in a mix of old oak and stainless tanks. St. Micheal - Eppan Pinot Grigio, Italy - This a nice Italian pinot grigio to fit in our list. St. Michael - Eppan Pinot Grigio is straw yellow in color with a nose of pears, apples, floral and mineral notes. It is medium-bodied with crisp acidity, good structure and rich flavors of apples, pears, peaches and citrus. Starmont Merlot, Carneros - Starmont is located on the historic Stanly Ranch in the Carneros region of Napa Valley. Built in 2006, the Merryvale Vineyard, owned by the Schlatter family, is a solar powered, sustainably farmed and Napa Green certified vineyard. This merlot has hints of blueberry with a sweet, mild palate. Mercer Estate Merlot, Napa - Medium bodied merlot that is great. This is one of our favorites from our tasting. Soon you will see this also poured by the glass. The flavor lingers on this one. Ripe black cherries mingle with aromas of tobacco, coffee, clove, and brown sugar. A hint of warm oak toast provides a subtle frame for the nose. T-Vine Zinfandel, Napa - This wine is loaded with ripe black and blue berries, loads of freshly cracked black pepper and hints of cinnamon. Layer upon layer of rich, dark berries are supported with a balanced acidity and lingering finish. As the wine opens up, the subtle hints of spice and smoke are showcased. Graham Beck Pinotage, South Africa - Made of pinot noir and cinsaut grapes. Medium bodied red with lots of spice. Aromas of ripe cherry, strawberries and plums with ripe red berry fruit. St. Micheal - Eppan Lagrein (pronounced lah- grine) - Lagrein is an ancient grape variety that finds its home in the sunny vineyards of Trentino-Alto Adige in northern Italy. Its wines are strong and full bodied with plum and wild cherry flavors, and the variety is particularly well known for the deep, dense color it imparts on wines. This would be characterized as a medium body with a spicy finish red. McGah Scarlett Zinfandel, Napa - The 3 best zinfandel wineries are Robert Biale, Seghesio and McGah. So this Scarlett Zin has only 47 cases produced. It has a strong nose and sits at about 16% alcohol by volume. Again, we have over 80 bottles on our list to choose from. Please do not limit yourself to our glass list. Even though you'll want to limit yourself to 2 glasses while you dine with us, you can take the remaining half bottle home with you. We provide a service where we "gas" your wine allowing it to be preserved for future consumption and package in a state-legal "wine doggy bag" for travel.